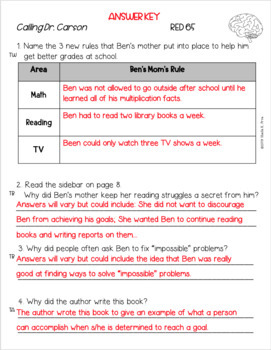 This FREE SAMPLE was created to give students additional comprehension practice for the LLI Red System book Calling Dr. Carson (#65, Level M). 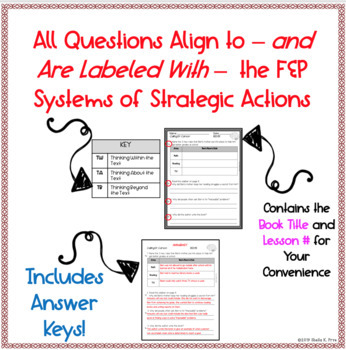 Each comprehension page contains questions that align to Fountas & Pinnell’s Systems of Strategic Actions: Thinking Within, About, and Beyond the Text. 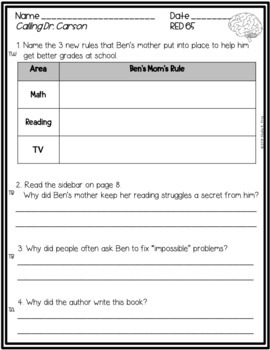 The questions are labeled accordingly on each page and span a variety of question types (multiple-choice, short answer, graphic organizer). NOTE: Leveled Literacy Intervention® is a trademark and/or registered trademark of Irene C. Fountas and Gay Su Pinnell. This file is an independent product and is not affiliated with, nor has it been authorized, sponsored, or otherwise approved by Irene C. Fountas or Gay Su Pinnell. 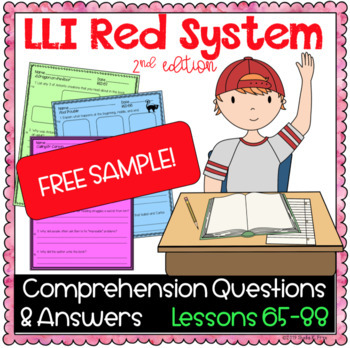 Click here for more LLI RED resources! Looking for LLI resources for the GREEN System? Click here. Looking for LLI resources for the BLUE System? Click here.